Lyle: Welcome! Here is the start of a new series of lessons, all about the basic bar chords. These can be very hard to play for many beginners, but I thought I'd go ahead and expose you to them now rather than wait. Think of this as your own library of chords. You'll be able to come back to these lessons any time you might need to find a new way to play a chord. The bar chords are made from the simple open position chords you learned earlier, they are just moved up the neck. Follow me, I'll show you! 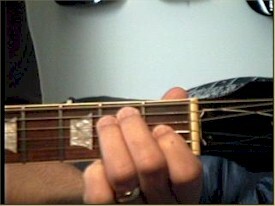 Lyle: Can you get both strings to ring clearly at the same time while pushing down on the 1st fret? 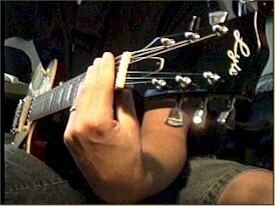 Lyle: If you're using an acoustic guitar, barring across all 6 strings is tough to do and takes a lot of hand strength. Lyle: All of these E chords have something in common, they all use the big E / 6th string as the root or bass note, and they all have a shape to them that is similar. Lyle: Let's take the basic E chord and move it up 1 fret and add a first finger bar to make an F chord. Lyle: Se how the shape of the E chord is the same as the shape of the F chord. Lyle: Roll your wrist down and away from you when making a bar so that your thumb is under your index finger. 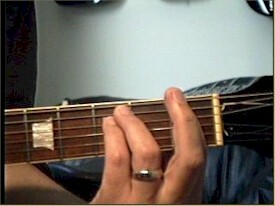 Lyle: When moving back and forth from E to F, or Em to Fm, you can keep the same fingerings for each chord, just slide the hand up and down a fret. Lyle: The last chord, FM7 or Fmaj7, doesn't use any barring, but you mute the 5th and 1st strings. 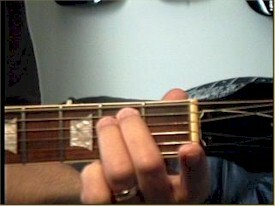 Notice the shape of the open position E chords and the barred F chords are the same. Lyle: We "transposed" the E chords up 1 fret to get to the F chords. Next I'd like to show you how each of the basic chords, (maj, min, min7, dominant 7 , and maj7) can be played all the way up the neck using these movable shapes. Here's all the plain major chords up the neck. 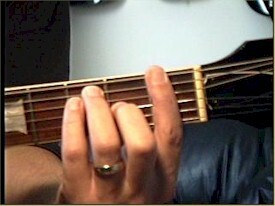 The 6th string is the root note. Lyle: So what are you supposed to do with all those chords I just gave you? Just understand them and where they came from. Memorize the shape, the name, and the root note along the 6th string. You can come back to this lesson later for your own review. Think of it as your own little chord library. Lyle: Here's a short chord progression for you to practice. Lyle: That's all for this lesson, next lesson is all about the movable A position bar chords.